Good morning all, what a quick weekend that was! I hope you all managed to get ome time to relax & a bit of fun time too! The Edinburgh Festival Fringe has begun, so the city is busy busy busy! looking forward to my stay-cation next week, when we can make the most of it! Here's the card I have to share today! It's a little A6 Baby Girl card. I used an image from La Pashe for the main focus. I used a spellbinders circle die to cut it out & a scalloped circle to mat. The edges have been distressed & inked a little. The embossing folder is a cuttlebug one if I'm not mistaken. The sentimet was done on the pc & I used a border punch for the decorative mat. The ribbons & heart gems are from my stash. Ooh La La Creations - Ribbons & Bows. Dies R Us Challenge - Babies. Come and Get It - Buttons and Bows. A Gem of a Challenge - Buttons & Bows. Gorgeous baby girl card, love the beautiful pram. I hope you have a wonderful week. 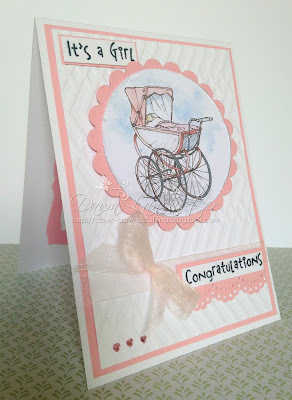 A pretty card Dawn, a fabulous vintage pram and lovely design. Such a sweet card. Love the baby carriage focal image ans soft pink colors. Thanks for sharing with us at Dies R Us Challenge. We hope tp see more of your creations. Such a sweet and pretty baby card, Dawn. I hope the weather is god for your Festival Wanderings! Oh Dawn this is just precious and so girly! Beautiful creation! Thanks so much for playing in our ‘BABIES’ challenge at Dies R Us! Please come back again soon! 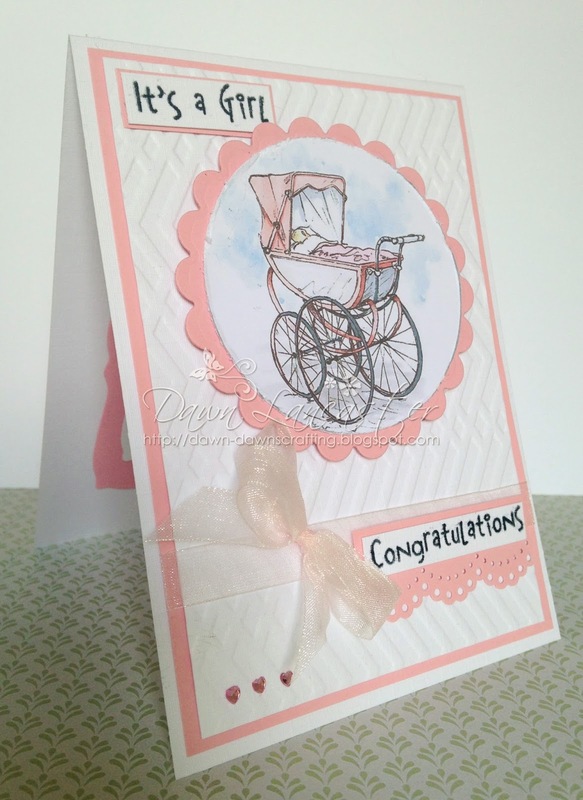 Beautiful baby card, love the vintage pram image and pretty pinks. Sweet card and love the soft pink. hi dawn. o wow! this is gorgeous. that carriage image is stunning! have a great week. So sweet Dawn, love that image and the embossing. Dawn, your card is so adorable. I love the image and your design.